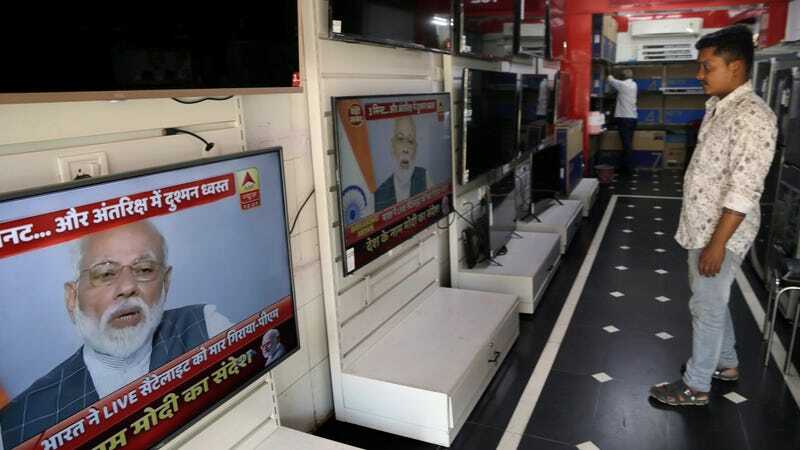 A salesperson watches Indian prime minister Narendra Modi addressing the nation on a television in Mumbai, India, March 27, 2019. In a surprise televised address to the nation, Prime Minister Narendra Modi announced India’s first successful test of an anti-satellite weapon, which the government used to destroy its own satellite. Modi said the test signifies India as a “space power,” but critics claim it’s a regrettable and reckless step toward the ongoing weaponization of space. India is now the fourth country to have tested an anti-satellite (ASAT) weapon, the others being the United States, Russia, and China. The 1967 UN Outer Space Treaty, to which more than 100 countries are bound, forbids the use of weapons of mass destruction in space, but no provisions exist against the use of conventional weapons to disable or jam satellites in orbit. (That said, the Council on Foreign Relations believes anti-satellite missile tests are arguably in technical violation of the treaty). India’s 3-minute test, called Mission Shakti, was initiated from an island near the country’s east coast, the foreign ministry said in a statement. 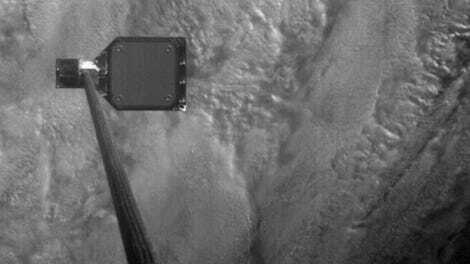 The test was done at a low altitude to ensure the resulting debris would “decay and fall back onto the Earth within weeks,” wrote the ministry, and not remain in space where it could damage other equipment in orbit. This incident is reminiscent of a notorious test conducted in 2007, in which China similarly destroyed its own satellite, spawning a huge debris field consisting of hundreds of objects. Both the United States and the former Soviet Union conducted anti-satellite tests from the 1950s through to the 1970s. That’s some exceptionally flowery language for what was clearly an unabashed display of saber rattling, and a conspicuous demonstration of India’s newfound capacity to work—and apparently, fight—in space. Indeed, India’s space program has been chugging along nicely over the past several years. The country now offers affordable launch solutions (in 2017 India set a record by deploying 104 satellites during a single launch) and space-based tech like Earth-imaging satellites. India sent a spacecraft to Mars in 2014, and it’s hoping to send its own astronauts to space by 2022. The timing of today’s announcement is questionable given that Modi is currently in the midst of an election campaign and the recent tensions between India and Pakistan. Modi’s critics claim the prime minister is deliberately (and possibly illegally) trying to swing votes. Also, the test occurred as the Group of Governmental Experts (GGE) met in Geneva to discuss the prevention of an arms race in outer space (PAROS); India’s actions can be construed as a kind of slap in the face. India was already a space power before this test, claims Jessica West, a program officer at Project Ploughshares and the managing editor of its Space Security Index. She finds it concerning that the nation needed a weapons test to further consolidate this standing. Jonathan McDowell, an astronomer at Harvard-Smithsonian Center for Astrophysics, said Mission Shakti is an unfortunate development that’s making space less safe. Indeed, despite the howls of protest garnered by the India test, it’s doubtful anything meaningful will be done in the near term to curb the ongoing weaponization of space. Complaints by the U.S., Russia, and China would be hypocritical given their capacity to do the same while at the same time exhibiting an unwillingness to relinquish such power. It appears that, as more nations venture into space, we’ll have to grudgingly accept this as being the new normal.